Go team, go!! 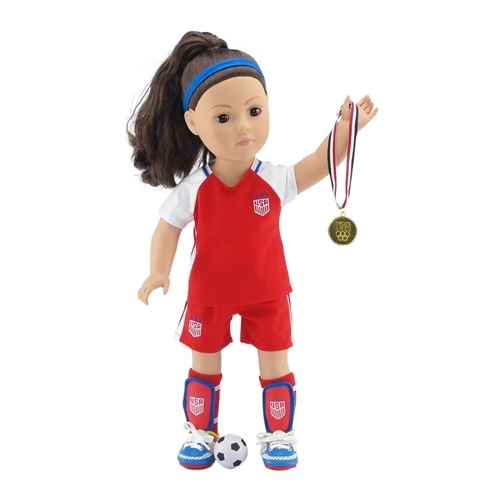 Your 18" doll will look super cool in this Team USA-inspired soccer doll outfit, perfect for showing pride in America! This soccer outfit starts with an awesome uniform, including a red and white short sleeved shirt with white side stripes and matching team shorts, both with USA-inspired team logo patches with blue stars! 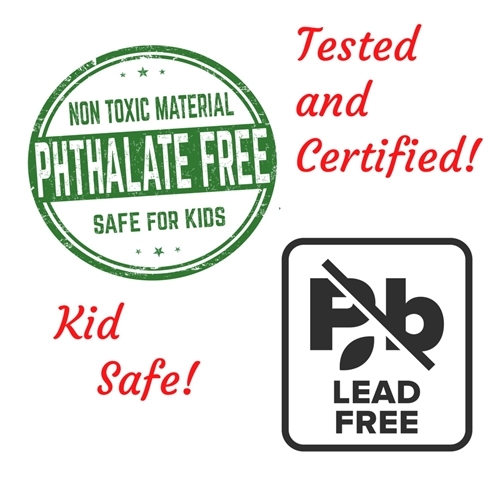 The tee shirt even has our special "no grab" Velcro closure, making getting dressed a snap! But that's just the beginning! 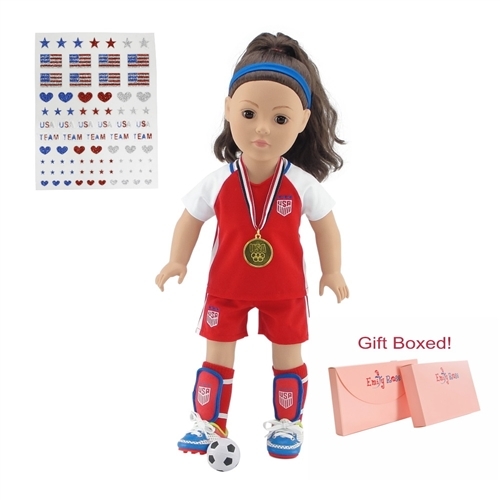 This amazing 18 inch doll outfit comes with knee length red socks, cool USA-inspired shin guards, bright blue stretch to fit sports headband, soccer ball, cool soccer shoes/cleats, and a realistic Olympic gold medal! Amazing 18" doll 8 piece Team USA-inspired soccer Outfit, including cool USA embroidered patches and large, realistic Olympic gold medal, for hours of pretend fun! Awesome Sports Value! Doll soccer outfit includes sporty red, white and blue shorts and shirt, thick matching socks, blue headband, shin guards, soccer ball, and an amazing pair of one of a kind red, white and blue soccer shoes/cleats!